This is one of the most amazing Young Adult books I've read this year. Leanna Renee Hieber takes you to a time and place where anything and everything is possible. Darker Still revolves around a portrait arrives at the Metropolitan Art Musesum, where Natalie's father works. Natalie that I really enjoyed the mystery of trying to free Denbury from the curse that placed him in the portrait, mainly because it was Natalie figuring everything out with a little help from some friends. I do love a heroine that takes action instead of letting others do everything, and Natalie was not one to sit back and let others take charge. It was just nice to see a heroine who knew what she wanted & while a bit afraid to go after it, she did it anyway. In the blurb it states that it's Dorian Gray meets Pride and Prejudice meets Dr. Jekyell & Mr. Hyde, and I just didn't see the Pride and Prejudice connection. Admittedly I am awful at reading into in between the lines, but didn't see Denbury as Mr. Darcy at all.The other connection I didn't get was how some people consider this book steampunk. Unless my definition of it is completely wrong (which it might be) I just saw this book as a YA paranormal romance set in the 1880s. The ending of the book after everything is concluded felt a bit rushed, but I think that is because I wanted more of Denbury and Natalie together. While it wasn't a cliffhanger totally left me wanting more of these two. I can't wait to see what trouble they get into next. 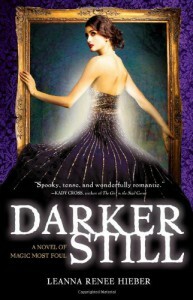 Darker Still was the first historical young adult book I've read, and I enjoyed it so much that I hope to read more in this genre. This book also makes me want to have a YA Meter system..must make one soon!